In the previous post we looked at ways to replace old thoughts about money and how you can start feeling abundant and prosperous (for free)! In this post we will open up the flow even more to decrease resistance around receiving more money and to shatter self-imposed limits regarding reaching the next income level. When people pay for goods or services received the energy they carry regarding that transaction is transferred to the money. When you in turn received that money via its circulation in the system that energy enters your wallet and space. This can be favourable if the person blessed their money and thanked it wholeheartedly for what they were receiving in exchange. However it can be unfavourable if someone had difficulty parting with their cash and begrudged the transaction coming from a place of fear, lack and grief. Symbolically cleansing that vibration from it and replace it with an uplifting, joyful positive one will serve you well. 1) Simply take a large bowl and place all your notes and coins in it. If you like incense, smudge over the bowl with some smoke alternatively lightly spritz a little blessed sea salt water solution over the bowl. 2) As you do so affirm that you are removing any previous programming that is in discord with an abundant, supportive, loving frequency that serves the greater good. Tap into happy thoughts about all the alchemical ways money transforms itself to bring what you choose to exchange it for into your life. Feel your heart space expand and sense the bowl and all its contents aglow in golden light. 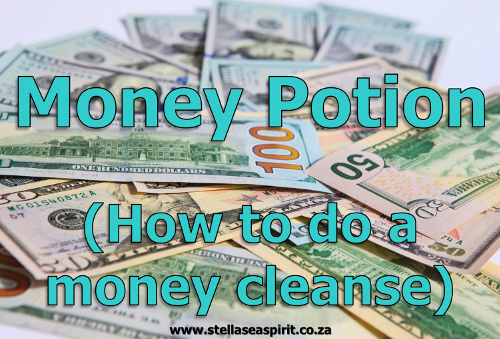 3) Cleanse your wallet in a similar fashion and then pack your magical moolah back into it while inviting more money to join these in this happy place. After all, if you were money would you prefer to be in a blessed, loving space or a resented one? Each time you take money out to pay imagine it going out into the world expanding the light in the world with the golden hue you blessed it with, trusting that whatever you spend will return to you with ease. Tip: In the spirit of infinite abundant flow, take a gold metallic marker and draw the infinity symbol on a dry bay leaf, then place it with the notes in your wallet so that you are reminded of the flow every time you see it! Basil (governed by Mars) creates a warm safe space in which to open up your heart, awakens the subconscious and stimulates self-recognition. Chamomile (governed by Venus) is harmonising and soothes the spirit and inner child in this instance regarding poverty consciousness from family and society that were internalised. Tip: Open up a chamomile teabag if you don’t have any on hand. Rosemary (governed by the Sun) assists in reminding you of the powerful creator being you are, boosting your success quotient and ability to perceive signals from the universe. Hold the money potion between both your palms in front of your heart centre and charge them with the emotional tides you associate with financial stability and ease such as clam, confidence, accomplishment, security or whatever feeling underpins this desire of yours for more money until you sense the life force within the ingredients stir. Once in the shower (or in the bath tub before you draw your bath) apply some of this cleansing money potion from head to toe. Right at the top of the crown of your head to beneath the soles of your feet and remember your back. Call to mind the feeling of releasing any old or subconscious beliefs and resistance around money that hinders your ability to receive more of it. Imagine it dissolving from your physical, mental, emotional and spiritual bodies. Open the shower tap to rinse off (or draw your bath water to hop in). Open to receive money in whichever form it wishes to make its way to you, allow yourself to feel the sensation of receiving this representation of life force and to surprise you in delightful ways! Refrain from thinking about how it will or must come to you along a specific avenue. Just savour the feeling the end result evokes within you. This ritual is especially potent when done regularly both at waxing moon to magnetise money to you and to dissolve barriers to receiving money at waning moon. Its effects are especially amplified when the moon is in Taurus and on dates with the number 8 in it to connect with the infinite abundant flow of life force. Read this post to incorporate a wicked technique to attract more clients. You can substitute the dried herbs with a few drops of pure essential oils if you prefer BUT if you are pregnant, breastfeeding, have high blood pressure or epilepsy DO NOT use these highly concentrated plant extracts without checking safety first.